The 2010 VSO Foray will be held June 12-20 in Culpeper and Fauquier Counties. These counties contain a large portion of the newly established Culpeper IBA (Learn more by downloading this pdf), which focuses on habitat for grassland and scrubland birds. Forest birds have traditionally received most of conservationists' attention, but there is an increasing awareness that grassland and scrubland birds have been neglected. Among these understudied birds, we will pay special attention to the loggerhead shrike, "one of the few North American passerines whose populations have declined continentwide in recent decades" (according to "Birds of America Online"). Virginia lies at the northern edge of the range for non-migratory loggerheads. These year-round residents tend to occupy permanent territories, so we are hoping to find overlooked shrike populations during the foray. Other "species at risk" in the Culpeper IBA include Upland Sandpiper, Henslow's and other sparrows, and Northern Bobwhite quail. The counties will be divided up among foray participants, who will canvas their areas as thoroughly as possible. We will carry out eBird-style "traveling counts" of up to five miles per count, counting all birds seen and collecting additional information on habitat and exact location if/when a shrike is seen. The foray headquarters will be the Best Western in Culpeper (540-825-1253), where we will convene for dinner on the two Saturday nights. There are several other motels in the immediate vicinity (within easy walking distance), including Rodeway Inn (540 825-8088), Microtel (800 771-7171), Comfort Inn (540 825-4900 or 877 424-64230 and the Holiday Inn (540 825-7444 or 877 863-4780). Those foraying Fauquier County may prefer to stay in Warrenton. Anyone wishing to participate in the foray should contact Susan Brown, either by email or at 757-665-4364. Does increased biodiveristy equal decreased disease? There are lots of good reasons to create more habitat around our homes, schools, and communities with native plants. Not only does this provide food, shelter, space and water for wildlife, but humans benefit from relatively low maintenance plants adapted to local conditions and the pleasure of viewing the wildlife they attract. Both wildlife and humans benefit from the improved water quality that can result. The biological diversity that increased native habitat supports could also be important to our health. A number of studies have now demonstrated a clear link between some important diseases and declining biodiversity. Two of those diseases, West Nile virus and Lyme disease, are of concern in Northern Virginia. 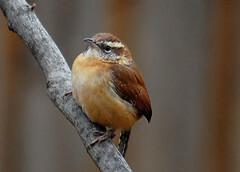 Not all birds or mammals that are bitten by the vectors of these diseases, mosquitoes and deer ticks respectively, provide effective reservoirs for their causative agents. For example, as researchers Richard Ostfeld and Felicia Keesing explain in the journal Conservation Biology, white-footed mice provide a highly effective reservoir for the Lyme disease bacteria compared to other small vertebrates. If the biodiversity of small animals in an area is high, there is a smaller chance that whatever animal a tick bites will be an infected mouse and hence less chance of that tick becoming a disease vector to humans. White-footed mice can survive in small forest patches fragmented by development better than most other small vertebrates. As a result, deer ticks are more likely to feed on infected mice in these habitats and eventually pass the disease to nearby humans. Greater biodiversity, however, could have the effect of diluting the disease reservoir, thus reducing the chances of human infection. A similar effect appears to occur with West Nile virus. Planting a native azalea probably won't reduce your chances of contracting Lyme disease, but concerted efforts to stabilize and restore our native biodiversity have the potential to reduce the prevalence some diseases. To increase native biodiversity means combating invasive exotics, setting aside more protected natural areas, more careful local land-use planning, and creating more native habitat on private and public land through programs such as Audubon At Home. We are planning to add another session of Audubon At Home and Beyond on Sunday, June 6, from 9 AM to 3 PM. Please contact ASNV naturalist, Cliff Fairweather, at cliff@audubonva.org or 703-256-6895 for more details or to register. For more information about Audubon at Home, check out our website. We need at least six participants in order to hold the class, so please register soon! Is there anybody who doesn't like M&Ms? Especially in trail mix that you take on a birdwalk? I doubt it. But this time, M&M doesn't mean chocolate candy, it means May & Migration, that time of year that sets birders' hearts a-flutter. Get out and enjoy the season! There is always a nice mix of spring migrants and returning summer residents in this natural area. Andy Rabin will lead the walk. For directions and additional information, click here. Beginners are welcome on this walk, led by Kathleen Britts and Jen Connors. Check the woods and the lake for spring migrants at Burke Lake Park. Meet at the carousel parking lot, first left after entering the park. Limit 10. Please sign up with the ASNV office at info@audubonva.org or 703-256-6895. Questions? Call Kathleen at 703-250-9225. For directions and additional information, click here. If you like to sleep in on weekends, but don't want to miss out on spring migration, don't worry -- Rob and Crystal Young are offering 2 opportunities to find these colorful jewels of spring at Riverbend Park. No limit, but please sign up with the ASNV office at info@audubonva.org or 703-256-6895. For directions and additional information, click here. Will the Green Herons be back? Join Matt Bender on this walk to find out. This walk is co-sponsored with Reston Association's Environmental Advisory Committee (EAC) and The Bird Feeder. Come a little early for coffee and donuts. For directions and additional information, click here. The LEAPP® (Learn, Enjoy, Appreciate, Preserve, and Protect) program offers the opportunity to learn more about the natural world and be informed, active stewards for its care and protection. To register or for more information, please visit our website, email us or call the ASNV office at 703-256-6895. Don't miss out -- register early! Please note that registration is not complete until payment is received. Visit our website for more information about these and other upcoming LEAPP programs. Ethnobotany is the study of how people use indigenous plants. Virginia's flora has a rich history of both real and imagined uses. This LEAPP workshop will familiarize participants in local floral legend, lore, and ethnobotany. The focus will be on native plants, but exotic species (and how some were used by people) will also be covered where appropriate. Plant identification, natural history, and animal associations and interactions will also be part of what is studied. The participants will also discuss the ethics and legality of collecting and the promise and danger of medicinal uses. The field trip will be to Thompson Wildlife Management Area in Linden, VA (see below for directions). Carpool arrangements will be discussed in class. The Thompson Wildlife Management Area one of the largest (millions!) great white trillium displays in the world! This area is resplendent with many (often rare) wildflowers and trees, including native orchids, which is why it is a wildflower registry site for the Virginia Native Plant Society. On the somewhat rocky 2-mile trail, we'll discuss plant folklore, ethnobotany, identification, and any other natural history we have a good chance to happen upon. Bring a bag lunch and water to eat on the trail. The Eastern United States is the best place in the world to see warblers, and 37 species are expected annually in Virginia alone! Warblers delight birders with their beautiful colors and cheerful songs, but they can also be frustrating to observe when they just won't sit still or when a flock passes by in the fall with many species looking similar to one another. This workshop will focus on tips for identifying spring males and females, the grouping of warblers by genus, conservation issues related to warblers, and where to see warblers in the Northern Virginia area. Warblers of the Great Lakes Region and Eastern North America by Chris Earley is a recommended text. Great pictures, well written descriptions, and migration timetables are all included. Success!! Opponents Stop Highway through Winkler Preserve!! Thanks to effective and broad advocacy efforts, the Virginia Department of Transportation has dropped the proposal to build a road and 34-foot exit ramp through the 44-acre nature preserve between I-395 and Beauregard Street in western Alexandria next to the Mark Center. VDOT attributed their decision in part to strong public opposition and especially people's strong objections to infringing on the preserve. The ramp and road would have taken 30 percent of the nature preserve through condemnation. ASNV provided comments at VDOT's public meeting and urged elected officials to oppose VDOT's plans. Conservationists argued that Winkler is a natural park in a densely-developed city, one of the largest forested parks in the city. The proposal would have reduced what is a naturally rich outdoor classroom and science lab for 12,000 students who have few comparable places to go in the city. The Winkler Preserve has forests, meadows, walking trails and a pond. A former pig farm and dump site, the land was donated by the Winkler family in 1979 and endowed as a nature preserve. Some trees are over 100 years old. Winkler has a rich biodiversity and is largely restored. Over 700,000 native plants have been planted. Auduboner Steve Bruckner spoke to Fairfax County's Tyson's Task Force on March 17 and urged planners to include bird-safe buildings in their plans to redevelop the Tyson's Corner area. Steve told the task force that as many as one billion birds may be killed by collisions with buildings every year in the United States, according to studies by Dr. Daniel Klem, of Muhlenberg College, Allentown, Pennsylvania. Between 50 and 90 percent of birds involved in collisions die, usually from internal hemorrhaging, according to the American Bird Conservancy. 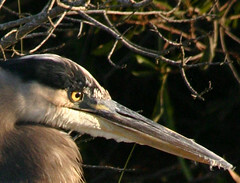 Many stunned or injured birds fall prey to cats and other predators. The problem is two-fold. Collisions often occur when birds fly into high rise buildings, because of glass in the buildings and lights on at night. Birds think reflections of vegetation are real vegetation and they try to fly through the glass. They are not always able to perceive glass as a barrier to be avoided. This is a particularly severe problem during the spring and fall migrations. Birds can also be confused by nighttime illuminations in and on buildings. In the dark, and especially in foggy or rainy weather, birds can be confused by artificial lights. Windows can be designed to reduce collisions by incorporating patterns in or on the glass and muting reflections of habitat and sky. Other design innovations include angling glass downwards at an angle of 20 degrees or more to reflect ground instead of sky, using sunshades, sunscreens, and other external devices to shield windows. More bird-safe glass products are under development. Bird-safe buildings should include design features, bird-safe building materials and minimal use of indoor and outdoor lights at night. In addition to reducing bird mortality, turning off or using less illumination can save money, conserve energy and reduce greenhouse gas emissions, Steve said. Thank you, Steve, for representing Audubon. Auduboners may wish to discuss these recommendations with their member of the County Board of Supervisors. Reduce total U.S. global warming pollution two percent a year and by 80 percent by 2050 by cutting emissions from carbon-based fuels like coal and oil. Move to clean energy from sources such as wind, solar, geothermal and sustainable biomass and enact a renewable electricity standard. Enhance energy efficiency. We must use less energy and use energy more efficiently in every sector and lessen dependence on cars. Virginia can reduce electricity use by 19 percent through steps like tougher building codes, says the American Council on an Energy Efficient Economy. Create five million new clean energy jobs. We must retrofit millions of buildings and homes, to save energy and money, create new jobs, stimulate economic recovery and cut greenhouse gases. Failing to act is costly. The warming of the planet will bring sea level rise and more severe weather events, storm damage, erosion and more vector-borne and respiratory disease. Were you lucky enough to see the varied thrush that's been visiting Herndon? If not, you can see Larry Meade's picture of the Western visitor on our Flickr site. If you're not a member yet, join today. It's easy.. Check out some of our other favorite photos! See more ASNV members' photos online! Please join us for the annual International Migratory Bird Count in Prince William County on Saturday, May 8. Visit our website for more information. Take I-95 to Lorton exit 163. Turn left on Lorton Road, right on Rt. 1, and left on Gunston Road. About a mile past the elementary school you will see Meadowood's horse pastures and signs on the right. Enter through the iron gateway, drive straight ahead and park by the stables. Northern Virginia may be getting a new children's science museum where youngsters will learn about science, technology, engineering and math. The current planning process offers us the opportunity to suggest that conservation and environmental stewardship be part of the museum. Plan to attend a meeting on April 29, 7 p.m., Fairfax County Government Center. Please RSVP if you will attend. Visit the Children's Science Center website for more information. This is a project of the Junior League of Northern Virginia.